This mild, smooth creamy sauce cloaking each strand of pasta makes this dish an all-time family favourite. Cook linguine for 10 minutes or until tender; drain well and return to pot. Meanwhile, in large skillet, melt butter over medium heat; add garlic and shallots, and sauté for 1 minute or until lightly browned. Add pancetta and sauté for 20 minutes. Add wine,bring to boil, and stir until most of the liquid has evaporated. Stir in cream; bring to boil. Reduce heat and simmer gently, stirring often, for about 3 minutes or until slightly thickened. Stir cream mixture and eggs into pasta; return to low heat for 2 minutes while tossing to coat. Season to taste with salt and pepper. Top with Parmesan and serve. Pancetta is Italian bacon that is cured, but unsmoked. It is available by the piece or deli sliced at most supermarkets. Cooking at home allows you to customize your meals. 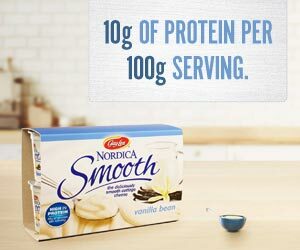 Create luscious pasta dishes by replacing cream with blended Nordica Cottage Cheese.